As covered in my recent blog post (My Thoughts On The Harry Potter Franchise), I said I would review each movie from the series. I will review the films in chronological order from first to last, which means I’m starting with Harry Potter & The Philosopher’s Stone, or Harry Potter & The Sorcerer’s Stone as it’s known in America. I’m going to call it The Philosopher’s Stone for now, because that’s how I remember the story and that’s what it’s referred to by the characters. Before I begin the review, I must warn any reader who has not seen this film that there will be spoilers. Normally, I try not to give anything away, but to avoid those elements would make it harder for me to complete the review. Any spoilers I give will be highlighted in red, so you can skip over them whilst reading. The film commences during the aftermath of the murder of James and Lily Potter by Lord Voldemort, where Professors Dumbledore and McGonagall and Hagrid are delivering the recently born son Harry to the Dursleys, Harry’s remaining relatives. Eleven years later, after having to put up with the neglectful abuse from his aunt, uncle and cousin, Harry receives an acceptance letter to Hogwarts School of Witchcraft and Wizardry. His luck finally comes and he attends the school, where he makes new friends, but also new enemies. In-between, Harry must be mindful that someone is doing some deed with Voldemort and wants a precious item that will bring him to power. Harry Potter & The Philosopher’s Stone was a good start to the series. It’s kind of an introductory film. 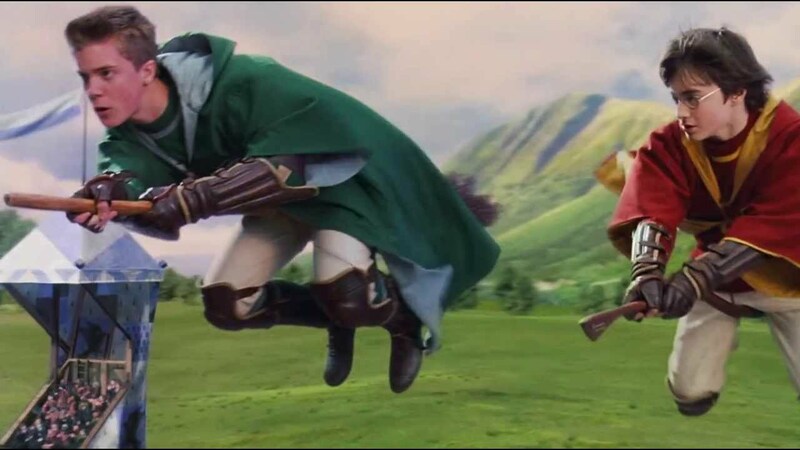 It introduced the main setting, the rules and requirements of the school, part of Harry’s back-story and who can forget the fictional sport, Quidditch, really well. The Hogwarts staff and students were also given a good start; most of them anyway, but I’ll get to that. At first, we believe that Professor Severus Snape is the villain who’s after the Philosopher’s Stone, but later we find out the real culprit; Professor Quirrell. 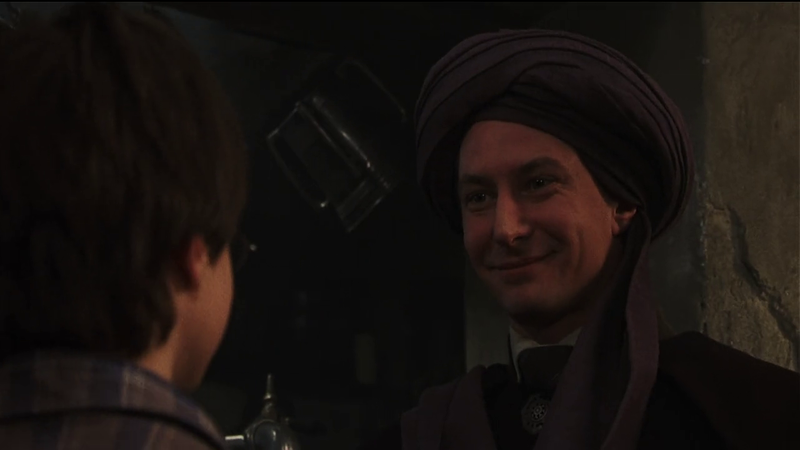 Quirrell is a badass example of a good guy gone bad. He’s the guy you’d least expect for him to be the main villain. He starts off as a nervous Defence Against The Dark Arts teacher who constantly stammers and appears innocent and friendly, even too shy to shake Harry’s hand when they first meet. Even the staff and students don’t assume that he’s nasty. That is until the finale when he confesses to Harry that he tried to kill him, by releasing the troll from the dungeon and jinxing Harry’s broom during a Quidditch match, and not Snape. One minor clue is one earlier scene where Harry finds Snape violently interrogating Quirrell (“you don’t want me as you’re enemy Quirrell”). It’s like Snape is the Phil Mitchell and Quirrell is the Ian Beale. This also contributes to Snape’s recurring theme; his longing to teach Defence Against The Dark Arts. Quirrell’s turban also makes an important contribution to the synopsis. He wears it all the time, but the reason why ain’t revealed until after his dark confession to Harry; he was using it to hide Voldemort’s face which happens to be at the back of Quirrell’s head. As pointed out in My Thoughts On The Harry Potter Franchise, the film does point out certain rip-offs. For instance, during the opening scene, Hagrid arrives on a flying motorcycle, which is similar-ish to the famous moon scene in ET The Extra Terrestrial. In a later scene, Hagrid lights a fireplace with an umbrella, which so looks like the bit where The Penguin uses his umbrella as a machine gun in Batman Returns. And do I need to mention Fluffy, the three headed dog? Not exactly the first dog to have three heads, was he now? Remember the story of Hercules, in which one of his twelve labours was to fight Cerberus? As you can imagine, this film is fairly cliched and those elements lower the originality of the film. When myself and my family came out of the cinema after the viewing, I remember stating that I found it enjoyable. My brother on the other hand found the film ‘a bit young for me’ and preferred the book. Of course, he was 14 and I was 11 at the time. I do remember the film sharing similarities, synopsis-wise, with the book, but the book was filled with nothing but text without a single picture, so how could I have possibly remembered the book as much as the film? With that said though, I can understand my brother’s statement. I mean let’s be honest; The Philosopher’s Stone is more light-hearted compared to the next Harry Potter films. It does have some dark elements, hence the flashback which sees the murder of Harry’s parents and of course the finale, but it is a very kid-friendly family film, hence the many squabbles between the kid characters, especially Ron and Hermione, that we’d have to sit through. The film’s more aimed for children than it is for adults. 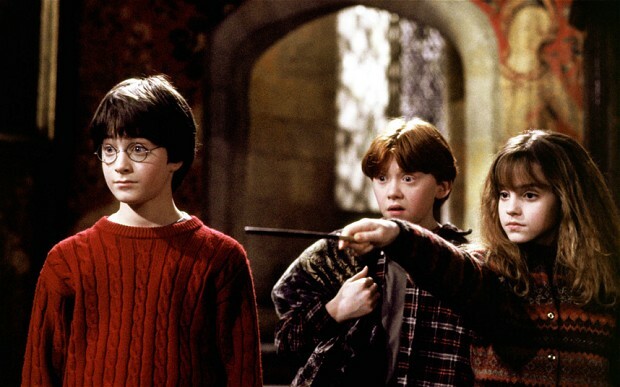 On the other hand, The Philosopher’s Stone is the first book/film in the series and many first films in a franchise or by a director/production studio are light-hearted flicks (i.e. Disney’s Snow White & The Seven Dwarves and George Lucas’ Star Wars IV). Although I don’t think the characters are too bad (I did point out how awesome Snape and Quirrell are), Draco Malfoy I thought was just a cliched bully and too pointless to include in this film, but he was provided better plot points as the series progressed. I’m also surprised that The Philosopher’s Stone is the only film which I ever saw Madam Hooch in. It’s a shame, because during the next films, her absence leaves us wondering who’s taking over her job as an instructor to broomstick flying and referee to quidditch. I think Hooch is quite an interesting character. She’s strong, she’s caring, there’s a scene where she’s lecturing the students on how to use the broomsticks and when Neville loses control of his, she orders him to come down. Then when he injures himself, she’s quite motherly to him (“oooh dear, it’s a broken wrist”). While taking Neville to the hospital, Hooch warns the others to stay on the grounds, otherwise they’ll get they’re butts thrown out of the school. I guess her role as Susan Harper from My Family paid off. I so wanted to see more of her! John Williams is an incredibly awesome choice for score composer. He would later compose the music for the next two films. He is in fact my favourite film composer of all time. Seriously, I love his works on E.T., Jurassic Park, Star Wars, Schindler’s List and many more. I most certainly give him credit for giving the Harry Potter franchise a signature tune. My only nitpick with the score on this film; it’s awfully repetitive and seems like the same volume most of the time. It’s like ‘okay, we get how the theme tune sounds. Can we change the track now?’. In other words, it’s like playing a CD and setting it to play a particular track in one continuous loop. Overall, Harry Potter & The Philosopher’s Stone is a decent film. Is it my favourite of the series? Of course not, we ain’t seen the others yet! But it’s a nice clean start to the series and it’s worth a viewing. There are plenty of classic moments from this film. If I had to pick a favourite scene, I’d go for the scene where Harry, Ron and Hermione wind up in a game of wizard’s chess; there’s a lot of action between the statue-like chess pieces, a lot of destruction and John Williams’ percussion piece pows with the violent rhythm!